Aetrex Customized Comfort Sandalista sandals hit the market in 2009 and provided women suffering from foot pain a great Summer option to feel the same comfort combination a good pair of shoes and orthotics give. In 2011, Aetrex released a new line of Cork Comfort Sandalista sandals that are at a better price point and feature the exceptional shock-absorbing properties of cork. Sandalistas are the first sandals perfectly designed for providing comfort to a woman’s foot. To start, the footbed is anatomically shaped and contoured to match the foot and eliminate pressure and friction. All Sandalistas proudly feature built-in Lynco Orthotic support to incorporate the benefits of the world’s most successful foot orthotic system. Instead of using firm materials, Sandalistas are made with IQ150™ Memory Foam that conforms to your specific gait/walking pattern and ensures an equal distribution of pressure while you walk. Sandalistas are available in two distinct collections: The Cork Comfort and Customized Comfort. The Cork Comfort collection merges the benefits of Lynco support with the light-weight, shock absorbing properties of cork and EVA. The Customized Comfort collection incorporates Aetrex’s patented Mozaic Customization Technology to allow you to immediately customize Sandalistas for the ultimate in personalized comfort and exceptional performance. The Customized Comfort collection sandals feature removable footbeds to let wearers use custom orthotics with the sandals. Click this link to read our previously written article on the Aetrex Sandalista Customized Comfort Collection. Aetrex Cork Sandals start at $88.95 and are shipped for free at the Orthotic Shop. At the time of this article, there are five styles of Cork Sandalistas that are available in many colors as shown below. The Orthotic Shop strives to provide a solid foundation for the foot & body. Purchase any style Lynco Orthotic Insoles and get $10 off the Cluffy Wedge at the Orthotic Shop. Combining both products is almost guaranteed to reduce foot discomfort and give your body & feet a solid foundation. The Cluffy Wedge was designed by podiatrist Dr. Jim Clough as a simple but effective way to fix stuck big-toe-joints. During his practice he realized that many people coming in with heel pain, ball of foot pain, Achilles tendon pain, leg, hip & back pain had stuck big-toe-joints (functional Hallux Limitus). In fact, he claims 90% of the patients he saw who suffered from those mentioned ailments had a stiff big-toe-joint. Dr. Clough claims that the big toe is like a light switch, allowing the foot to function two different ways, as a shock absorber, then as a stable structure. When the big toe is stuck, it’s like a light switch you cannot move. The Cluffy Wedge® allows the big toe to move freely, allowing the switch to work. Now it is possible for the foot to function as it was intended with normal motion of the big toe joint. After tracing the problem to the big-toe-joint he came up with a solution, the Cluffy Wedge. 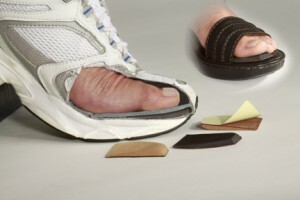 How it works is that it is stuck onto the underside of a shoe’s insole or an orthotic device. It can also be used with sandals when stuck on top of the footbed. Many people find great success when used in conjunction with an arch supportive orthotic that provides additional alignment and stability of the foot. Which is why the Orthotic Shop is offering such a fantastic deal on the Cuffy Wedge when purchased with a Lynco Orthotic. If you already have an Orthotic Insole you can still benefit from the buy one pair of Cuffy Wedges at full price and get another for half price special. 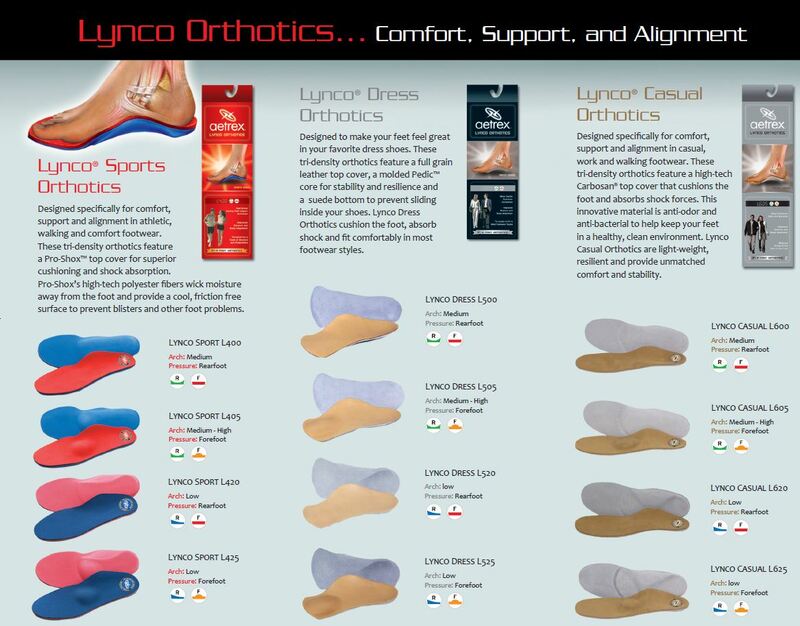 Lynco Orthotics by Aetrex is the World’s #1 Orthotic System. 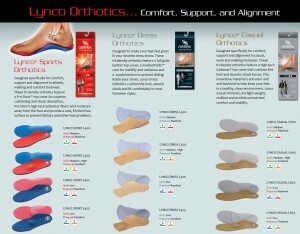 Lynco Orthotic Insoles provide the Comfort, Support and Alignment needed for all day foot comfort. The Orthotic Shop carries all of the Lynco Models and the informative application guide makes it easy to figure out which model you need. The L400/L405/L420/L425 Sports orthotics features a Pro-Shox top cover for superior cushioning and shock absorption. Pro-Shox high-tech tech polyester fibers wick moisture away from the foot and provide a cool, friction free surface to prevent blisters and other foot problems. Very good choice for use with the Cluffy Wedges. The L500/L505/L520/L525 Dress Orthotics are 3/4 length so they fit in all types of shoes and feature a full grain leather top cover, a molded Pedic™ core for stability and resilience and a suede bottom to prevent sliding inside your shoes. The Dress orthotics are not well suited for the Cluffy Wedge as it is only 3/4 length. foot and absorbs shock forces. This innovative material is anti-odor and anti-bacterial to help keep your feet in a healthy, clean environment. An Excellent choice for use with the Cluffy Wedge. To embrace the special discount, add a pair of Lynco Orthotics to your cart, the application guide is found at the link. Then add the Cluffy Wedge to the cart and a $10 discount will appear. If you don’t need orthotic insoles there is still a special that applies to you. Purchase one pair of cluffy wedges at full price and the second pair is half off! The Orthotic Shop strives to provide a solid foundation for the body and we are proud to offer both these products at a great price to our customers.